At low tide along the coastline of the Bay of Fundy in New Brunswick, Canada explore the natural phenomenons known as Hopewell Rocks, Flowerpot Rocks. The flowerpot rocks at Hopewell Rocks Provincial Park in the Bay of Fundy along the Fundy Coastal Drive in New Brunswick are fascinating natural creations to explore at low tide. The power of the ocean and the tides have carved away at the sandstone for thousands of years which in turn has produced the flowerpot rocks. Twice a day when high tides sweep into the Bay of Fundy, the flowerpot rocks still get altered in their appearance. Flowerpot Rocks, Hopewell Rocks, Hopewell Cape, Shepody Bay, Chignecto Bay, Bay of Fundy, Highway 114, Fundy Coastal Drive, New Brunswick, Canada. 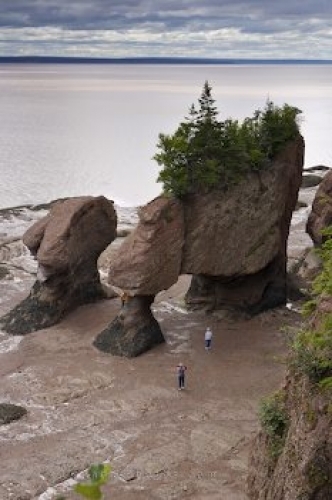 Picture of the flowerpot rocks at Hopewell Rocks in the Bay of Fundy in New Brunswick, Canada.